Intel today unveiled a full range of 9th-generation processors, including new mainstream and X-series chips for enthusiasts and content creators. The Core i9-9900K is its best gaming desktop chip so far, according to Intel, boasting a maximum single-core Turbo Boost 2.0 frequency of up to 5.0GHz. It is based on the same Coffee Lake architecture as the older 8th-generation chips, but it takes advantage of a more refined 14nm++ process that lets Intel cram more cores with similar frequencies into the same power envelope. In addition, it features a new unified cache design, which means that each of the eight cores can make use of the 16MB of L3 cache. Finally, it supports AVX2 instructions as well, so it can execute multiple forms of data with just a single instruction. The 9th-generation CPUs also use solder thermal interface (TIM) material, a step up from the previous generation which just used thermal paste between the die and the heat spreader. Solder TIM provides increased thermal conductivity between the CPU die and the integrated heat spreader, which improves heat dissipation and allows for more thermal headroom. In addition, the 9th-generation processors will work with Intel's existing 300-series chipsets, so you won't need to buy a new motherboard if you already own one of these. That said, Intel is also launching the new Z390 chipset, its mainstream flagship, alongside the 9th-generation CPUs. It offers just minor upgrades over Z370 however, featuring native support for USB 3.1 (Gen 2) and integrated Intel Wireless-AC with support for Gigabit Wi-Fi. The number of PCIe 3.0 is unchanged from the previous generation, comprising 16 from the CPU and 24 from the chipset itself. Performance-wise, Intel is claiming a roughly 10 per cent improvement in games compared to the Core i7-8700K (3.7GHz, 12MB L3 cache) and 34 per cent faster video editing. That aside, the higher core and thread counts should make the chips more suitable for streamers who need to game with as little a performance drop-off as possible. 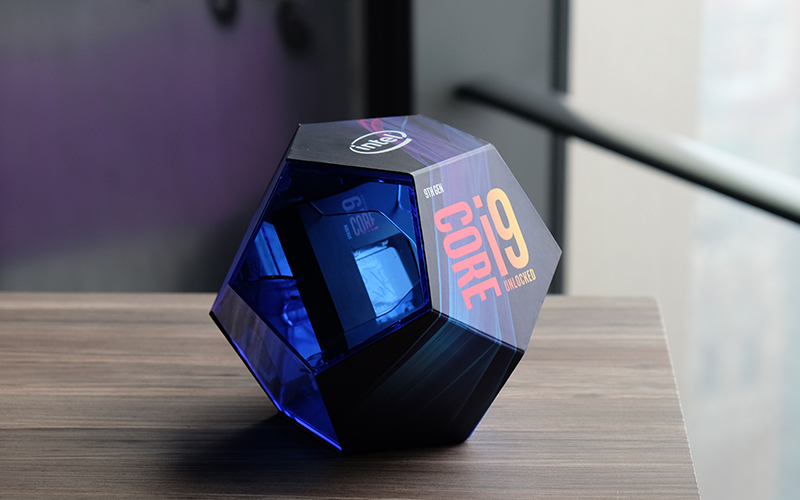 The Core i9-9900K looks like it might be an overclocking beast as well. In one of its demonstrations, Intel managed to overclock the chip to 6.8GHz on liquid nitrogen. There's another bonus from a security perspective. The new 9th-generation chips are among the first to include silicon-based mitigations for the Meltdown vulnerabilities. 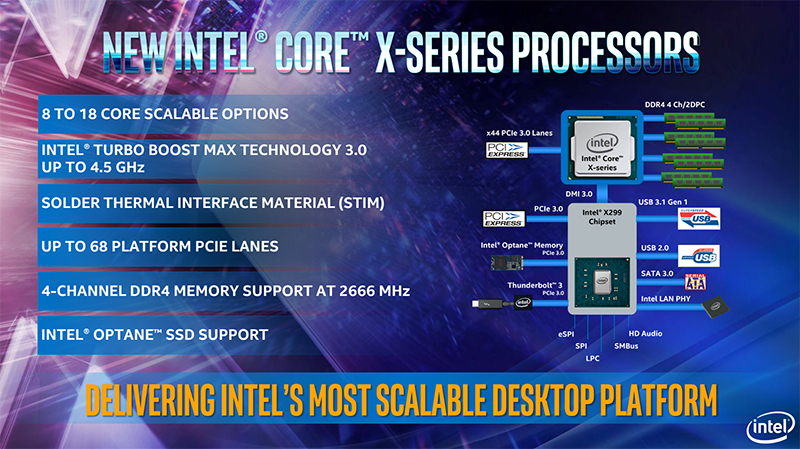 Intel has also overhauled its entire X-series range of processors. The new line-up includes 8- to 18-core SKUs, so Intel is still a ways off from catching up with AMD in terms of core count. The new chips use solder TIM and feature up to 68 platform PCIe 3.0 lanes. In addition, there's support for Intel's Optane Memory. What's clear is that Intel is leaving behind its odd Kaby Lake-X chips for good. The company quietly discontinued the Core i5-7640X and Core i7-7740X in May, and the new Core X chips start at 8-cores and 16-threads, a far more reasonable starting point for a line of enthusiast chips. 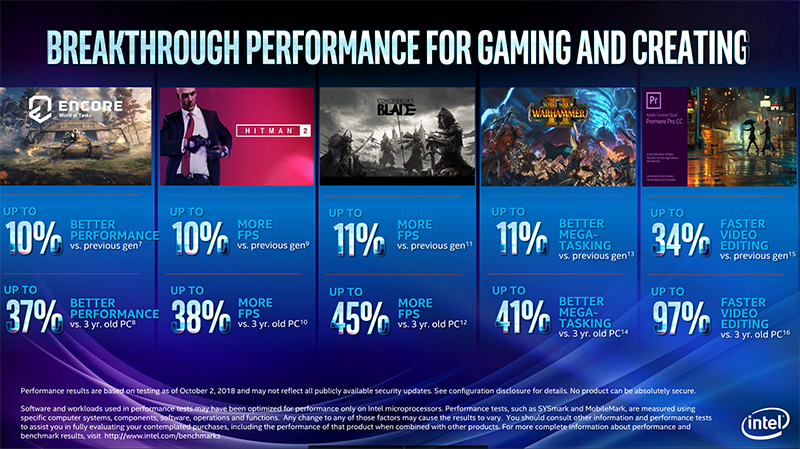 Intel is also repositioning the Core X line, targeting it at content creators rather than gamers. This no doubt sets it up to more directly challenge AMD's Threadripper processors in heavily threaded workloads, and the company is keen to stress that performance in this area is about more than just core counts. The chipmaker says that its Turbo Boost Max Technology 3.0 should help its processors find a more effective balance between lightly and heavily threaded workloads. Turbo Boost Max can identify the processor's two fastest cores and direct critical workloads to them, thus optimizing performance in lightly threaded scenarios. In addition, support for AVX-512 instructions allows for acceleration of compute performance for parallel workloads. This should come in handy in areas like financial analytics, 3D modeling, and image and video processing. 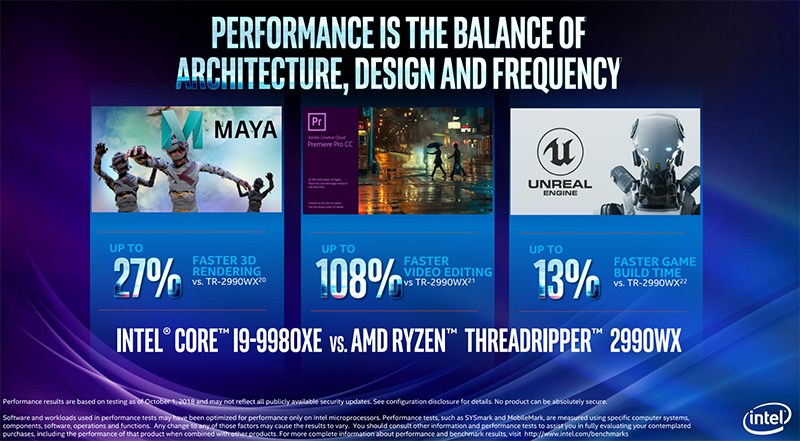 The elephant in the room here is clearly that AMD has a shipping 32-core consumer chip in the Threadripper 2990WX, but Intel is still stuck at 18 cores. That said, Intel claims that its flagship Core i9-9980XE can still outperform the Threadripper 2990WX in certain key areas. After all, it's true that core count isn't the be-all and end-all of performance. Take these numbers with a pinch of salt, but the Core i9-9980XE is supposedly up to 27 per cent faster in 3D rendering in Maya, 108 per cent faster in Premiere Pro CC, and 13 per cent quicker in game build time in Unreal Engine. 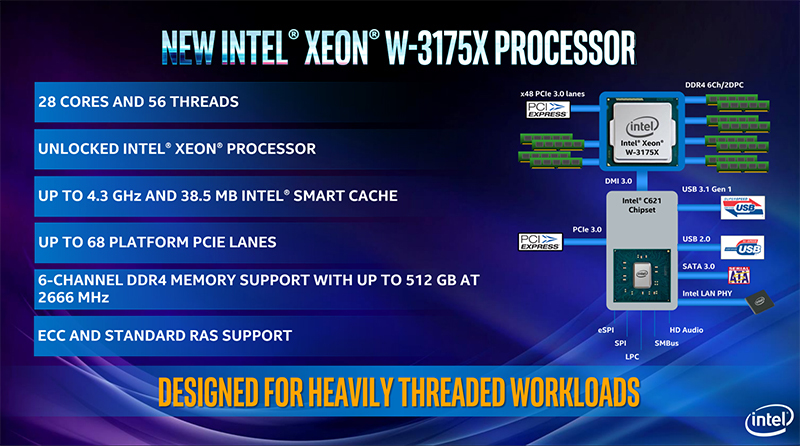 Last but not least, Intel also unveiled the Xeon W-3175X, a 28-core/56-thread workstation chip with a 3.1GHz base clock and 4.3GHz Turbo Boost 2.0 clock. It has a TDP of 255W and supports up to six-channels of DDR4-2666 memory. In addition, it features up to 68 platform PCIe 3.0 lanes and has 38.5MB of Intel Smart Cache. Intel didn't say whether this was the same 28-core chip that it showed off at Computex 2018, but it seems like there's a good chance it could be. The 9th-generation chips will begin shipping on 19 October, but pre-orders open today. The X-series processors will ship later in November, while the Xeon chip will ship only in December. Note: This article was first published on Oct 9, 2018.